Attitude, behavior, and beliefs are all key concerns that eLearning professionals should consider when designing eLearning courses. In this article, I’ll explain 3 key principles of the Cognitive Dissonance Theory, and I'll share 3 tips on how to apply it in your next eLearning course. Leon Festinger is the founder of the Cognitive Dissonance Theory , which suggests that learners try to achieve consistency between their beliefs, opinions, and other cognitions. When an inconsistency occurs they will alter their behavior or attitude in order to reduce the "dissonance". Festinger believed that this was one of the most powerful motivators, as learners want to avoid the discomfort, pressure, and tension that a dissonance can cause. In essence, when there are two behaviors, actions, or cognitions at war within their minds, learners are more likely to make meaningful change to remedy the issue and seek alignment. Dissonance occurs when an online learner is forced to choose between cognitions and behaviors that contradict each other. Cognitive dissonance can be alleviated or eliminated by reducing the significance of the cognitions that are in conflict. If you reduce their value they are no longer important to the individual. Online learners can also eliminate the dissonance by accepting new beliefs and opinions or removing the behavior that is causing the conflict. 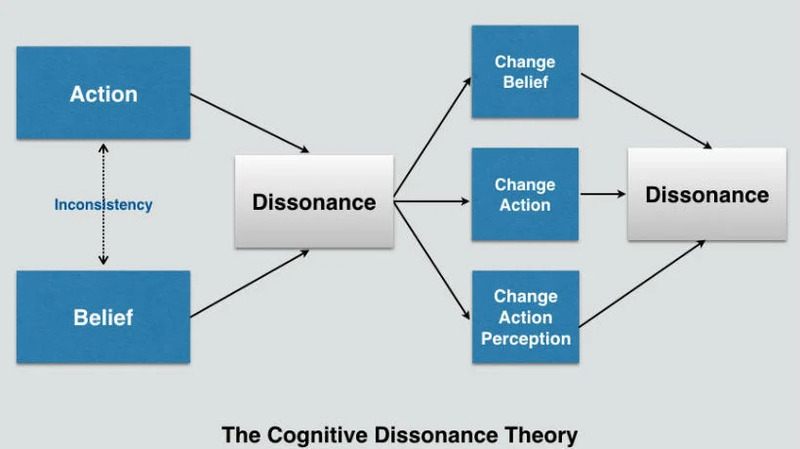 There are two key factors that influence the strength of cognitive dissonance: the amount of conflicting beliefs and the value associated with those beliefs. In other words, an online learner will feel more tension and anxiety when there are a number of dissonant beliefs which are extremely important to them. If online learners are able to convince themselves that the dissonant belief is false, they can remove the tension. In essence, this reduces the value of the existing belief and allows a new consonant belief to take its place. This can be a daunting task, however, especially if it is a long held belief that is part of the online learner's core value system. For instance, a belief that they have ingrained into their personal philosophy. eLearning professionals can encourage online learners to reduce the value of the conflicting belief by challenging their assumptions. Ask them thought provoking questions that prompt them to reflect on their existing opinions or ideas, and then determine the origin of these cognitions. They might discover that the belief originated from an unreliable source or unfavorable experience. Thus, they are more likely to question its true importance. This involves adding a greater number of consonant beliefs than dissonant beliefs. For example, offering your online learners factual information that convinces them to change their minds according to their beliefs. This approach appeals to your online learner's practicality. If they are presented with evidence that a belief is false or that it will hinder their well-being, they will probably reevaluate that belief and its importance. This is why it's essential to give your online learners all of the data, stats, and facts they need to make an informed decision. Encourage them to share their ideas and thoughts and then give them the eLearning resources they can use to explore the topic on their own. Change either the dissonant belief or behavior so that there is no longer a conflict. For example, an online learner can modify a dissonant behavior to align it with their current beliefs, especially if they know that the belief is based in fact and will help them reach their goal. This can be a challenging endeavor if the behavior is a habit, however, as the online learner must acknowledge that the behavior is unproductive, then unlearn it in order to form new habits. To remove the dissonant conflict eLearning professionals can create branching scenarios, demos, and eLearning simulations that reinforce positive performance behaviors. These eLearning activities also help online learners see the repercussions of their actions and identify the root cause of the problem. If they discover that their actions are creating a conflict, for example, they have the opportunity to learn a better approach. One of the most significant challenges that online learners face is dealing with ambiguous dissonances. For instance, if there are pros and cons for both the behavior and the belief, they will have to weigh the options before deciding. If this is the case, eLearning professionals should encourage their online learners to focus on their goals and objectives to determine the best course of action. It's also vital to remember that some online learners may not behave as the theory suggests. For example, online learners with lower stress levels or less anxiety might not follow the "rules". In fact, you may discover that certain members of your audience cope with dissonance quite well. The key is to do your eLearning audience research and learn as much as possible about your online learners' traits and emotional state in order to create personalized eLearning experiences. Are you designing an eLearning course for more mature audiences? Read the article Cognitive Limitations Of Adult Learners In eLearning: 6 Factors To Consider to discover what you should consider when dealing with the cognitive limitations of adult learners.